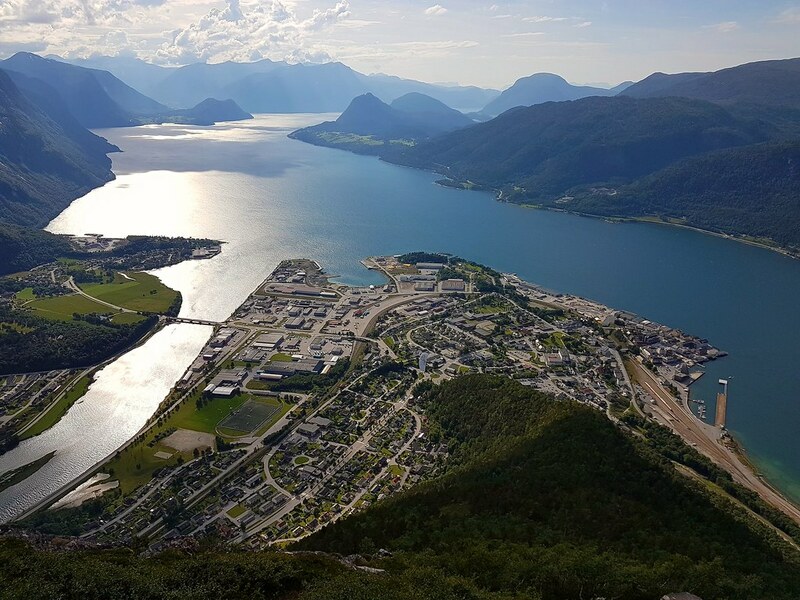 With mountains reaching up to 2.469 meters and dropping almost straight down into the fjords, and with the longest coastline in Europe, Norway has a lot to offer in terms of thrilling hikes and spectacular views. 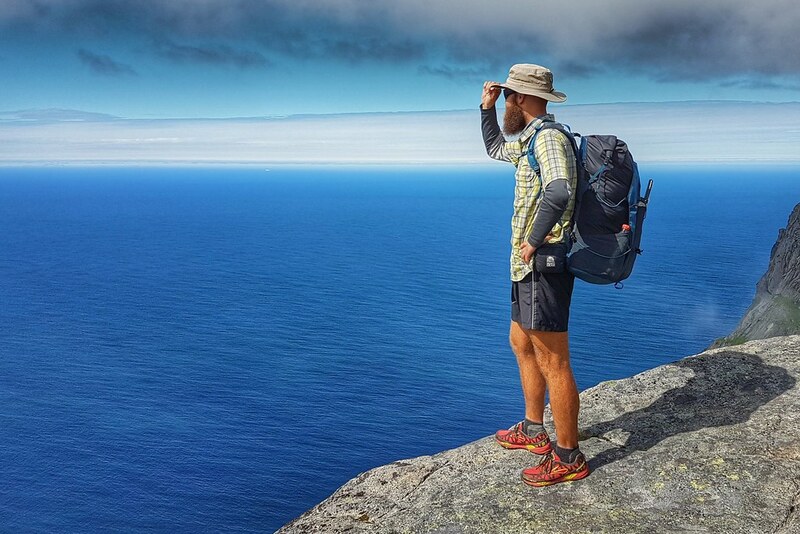 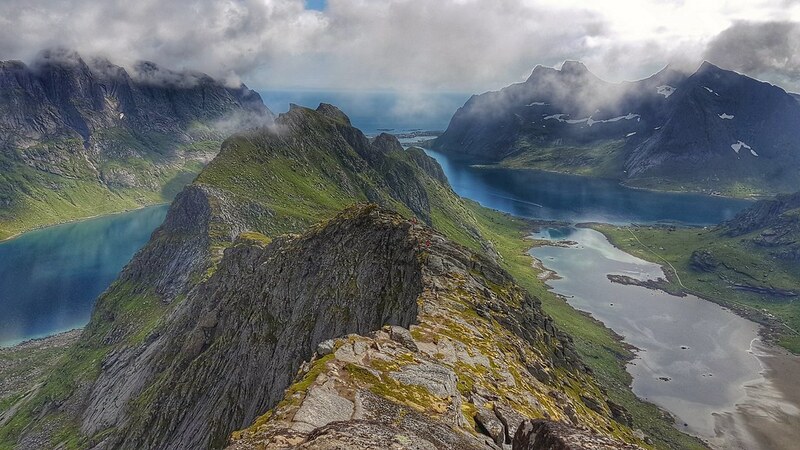 Here is my pick of the 7 most spectacular day hikes in Norway. 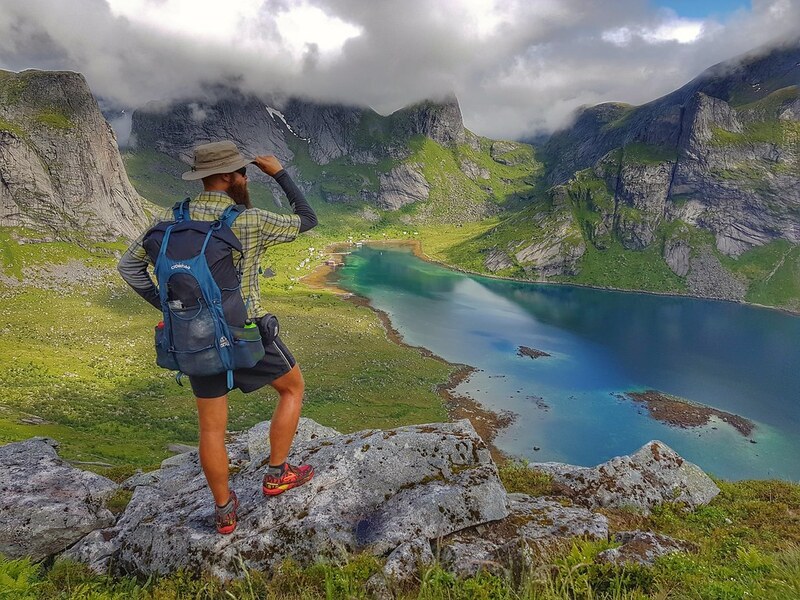 Located in Romsdal, just outside of the town of Åndalsnes, Romsdalseggen is arguably THE most spectacular day hike in all of Norway. 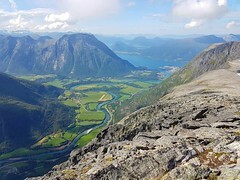 The trail starts off at 375 meters above sea level in Vengedalen and ascends 800 meters up to the Romsdalseggen ridge. Once you’re up on the ridge, and weather permitting, you have the most spectacular views of the mountains of Store Vengetind, Romsdalshorn and Store Trolltind, as well as Trollveggen (the tallest vertical rock face in Europe), the valley of Romsdalen, Moldefjorden and Atlantic Ocean in the far distance. 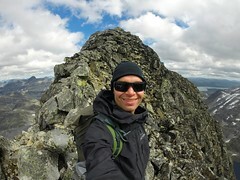 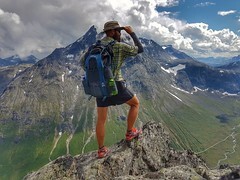 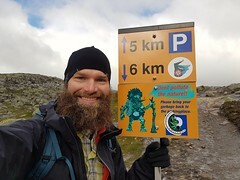 Many hikers chose to include a side trip up to the summit of Blånebba before heading west along the ridge and finally descending down towards Åndalsnes. 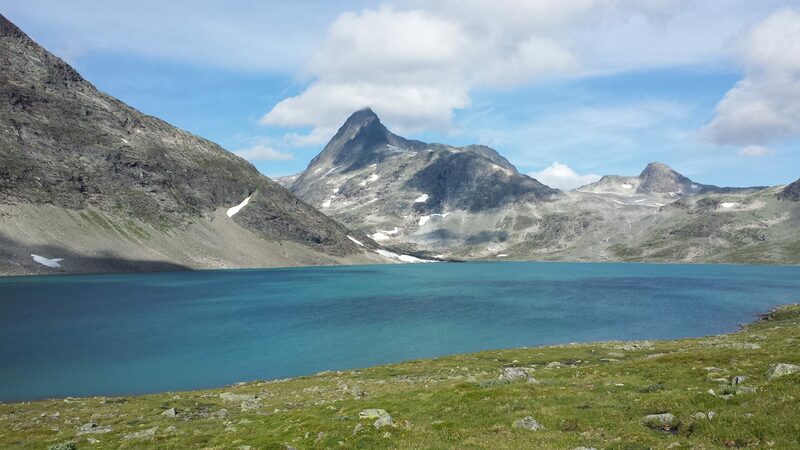 The hike over Romsdalseggen is 13 km, including the side trip to Blånebba, and takes about 8-10 hours to complete. The mountain of Helvetestind is located on the Island of Moskenesøya in the Lofoten archipelago in northern Norway. 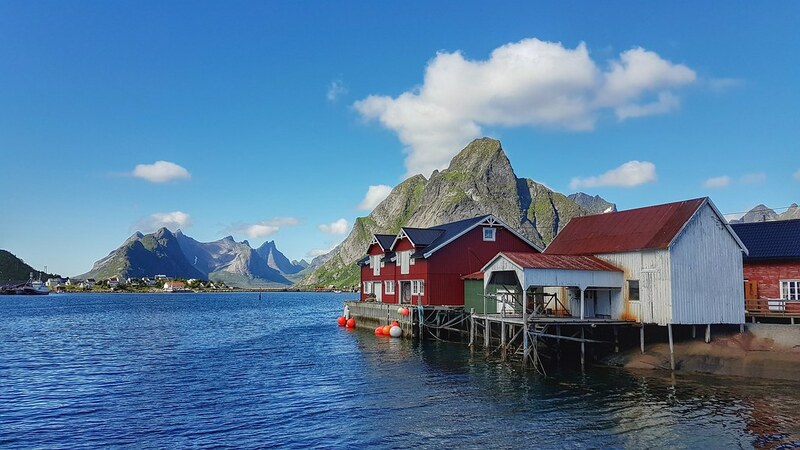 While its 602 meters may not sound too impressive, I can assure you that a trip to Helvetestind truly captures the beauty and essence of Lofoten. 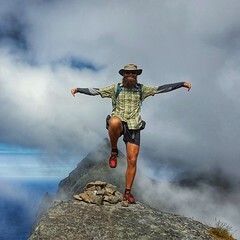 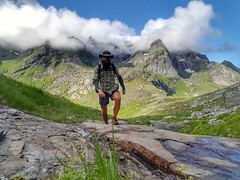 The breathtaking combination of granite and gneiss mountains rising straight from the sea and overlooking the Atlantic Ocean, emerald green fjords and beautiful sand beaches is bound to amaze all but the most jaded of hikers. The trip to Helvetestind starts with a boat ride from the village of Reine to the abandoned village of Vindstad. 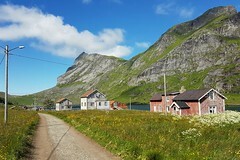 From Vindstad you walk on a dirt road to the end of Bunesfjorden. The road eventually turns into a trail first taking you the saddle at Einagen and then north-east up onto the ridge and to the summit of Helvetestind. The hike is 8 km round trip from Vindstad and takes about 4 hours. Preikestolen (Pulpit Rock) is one of the most popular day-hikes in Norway. Some 200.000 people make the trip each year. The popularity is partly because of the close proximity to the city of Stavanger and how easily accessible it is, but the views of Lysefjorden make it well worth the trip. The trail starts at 270 meters above sea level at the lodge at Preikestolen Fjellstue and follows a combination of dirt trail, board walks, stairs and slick rock up to the Preikestolen plateau at 604 meters. 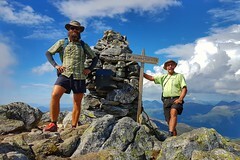 The hike is just shy of 4 km each way, and a round-trip takes about 4 hours. The trail can be quite crowded in high season from June through August. 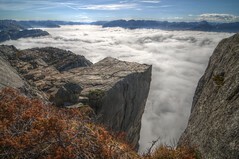 Plan to hike in the shoulder season, April/May or Sept/Oct, if you want to avoid the crowds. 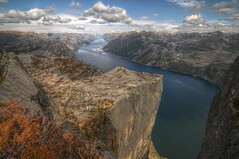 Kjerag is located on the south side and on the opposite end of Lysefjorden from Preikestolen. 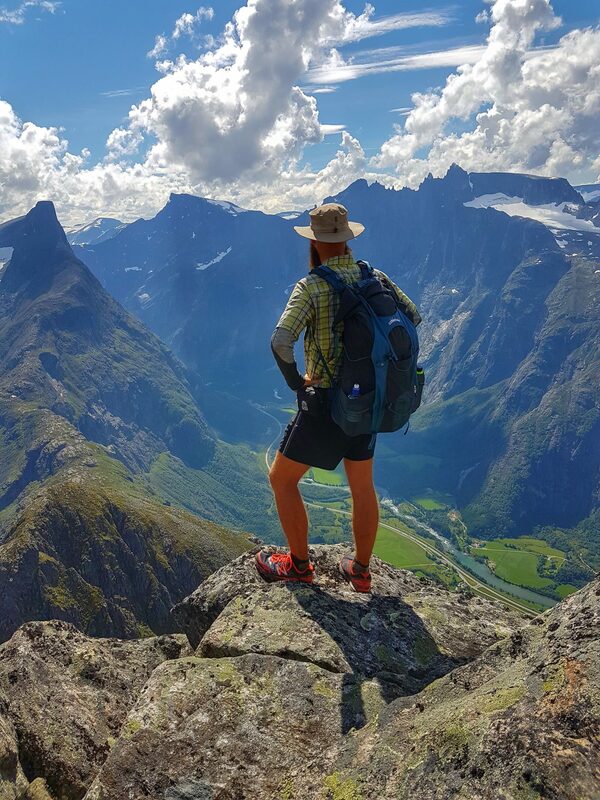 The trail starts from Øygardstøl where there’s a parking lot and a café overlooking the valley floor and the small community of Lysebotn. From Øygardstøl it’s about 4,5 km in distance and 400 meters of elevation gain to get to Kjerag, about 5-6 hours for a round trip. 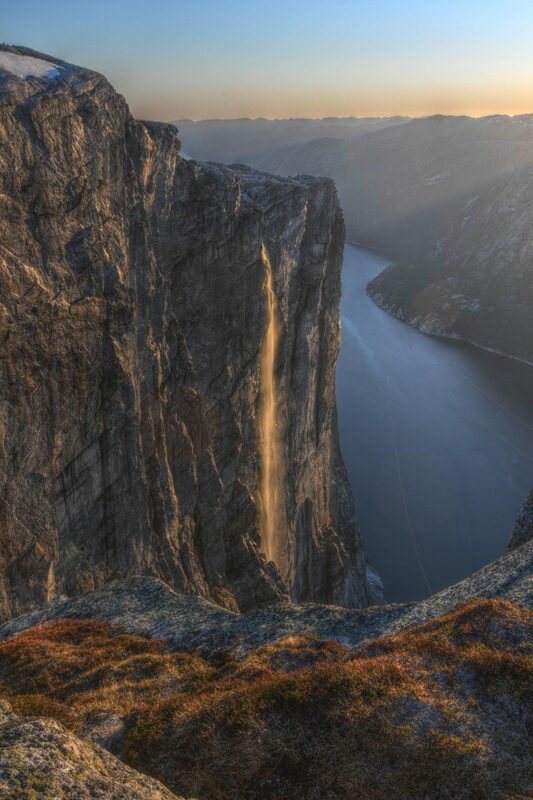 Most of the trail goes over slick rock. 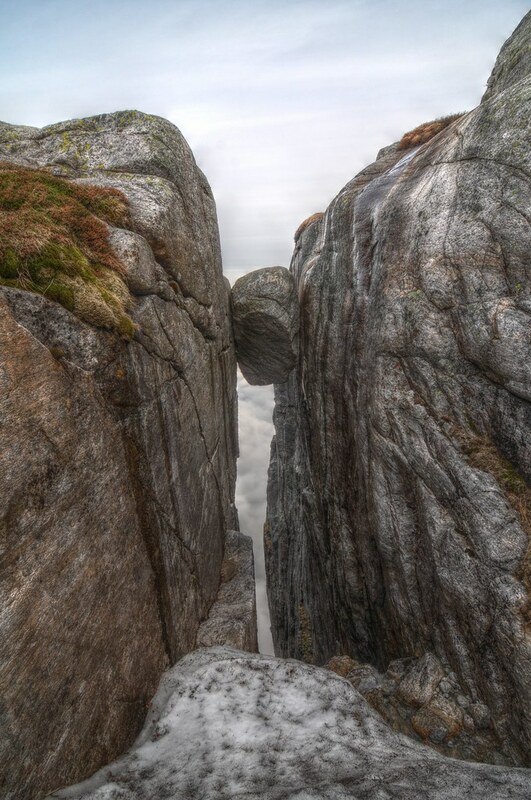 Kjerag is the home of Kjeragbolten, a big boulder that is wedged in a crack in the mountain, 1.000 meters above the valley floor. 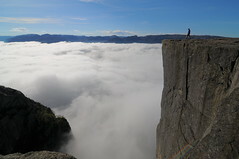 Those who are daring enough can climb out on it and have their photos taken. 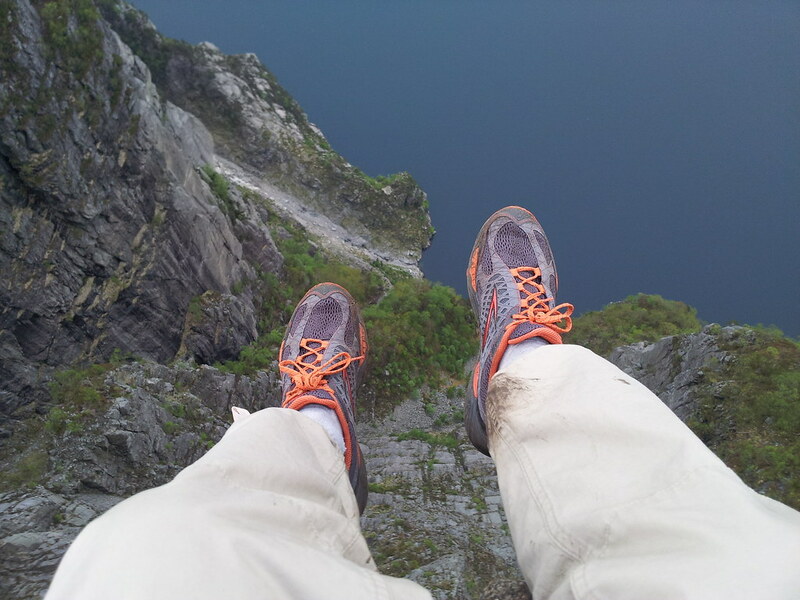 Ah, the things we do for social media… Kjerag is also a popular destination and exit point for BASE jumpers. If you are lucky you might catch a glimpse of the BASE jumpers as they throw themselves over the edge aiming for the landing zone some 1.000 meters below. Kjerag is arguably more spectacular than Preikestolen, but due to the fact that it’s further away from Stavanger and a slightly longer hike it doesn’t see quite as many visitors as Preikestolen. 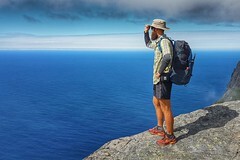 You won’t be alone though. Trolltunga is located in Hardanger, on the western edges of the Hardangervidda mountain plateau. The trail head to Trolltunga is Skjeggedal, some 20 minutes driving from the town of Odda. 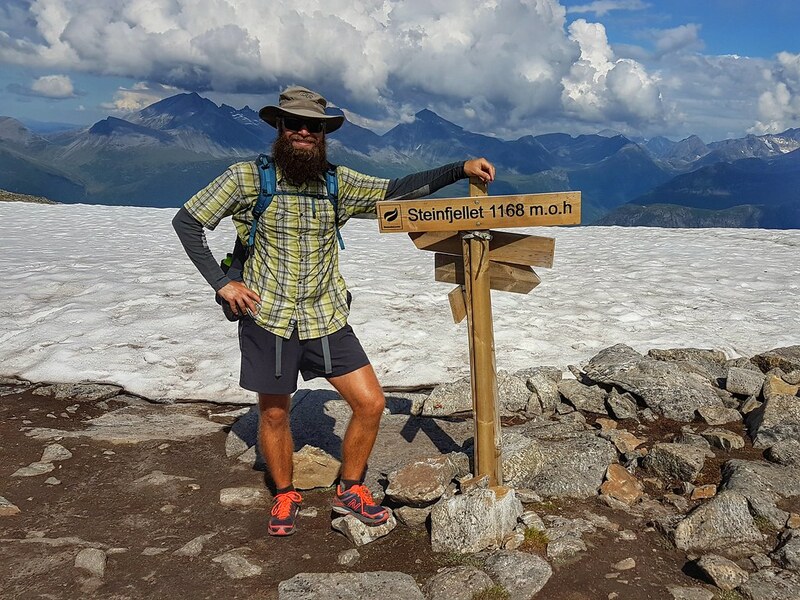 The trail starts off at 415 meters above sea level and climbs out of the valley and almost up to 1.200 meters over the first 4 km. 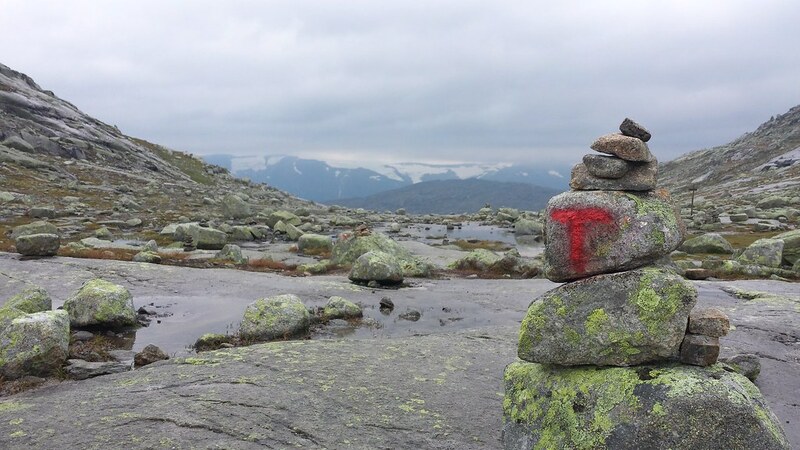 The trail hovers between 1.100 and 1.200 meters for the remaining 6,5 km to Trolltunga. 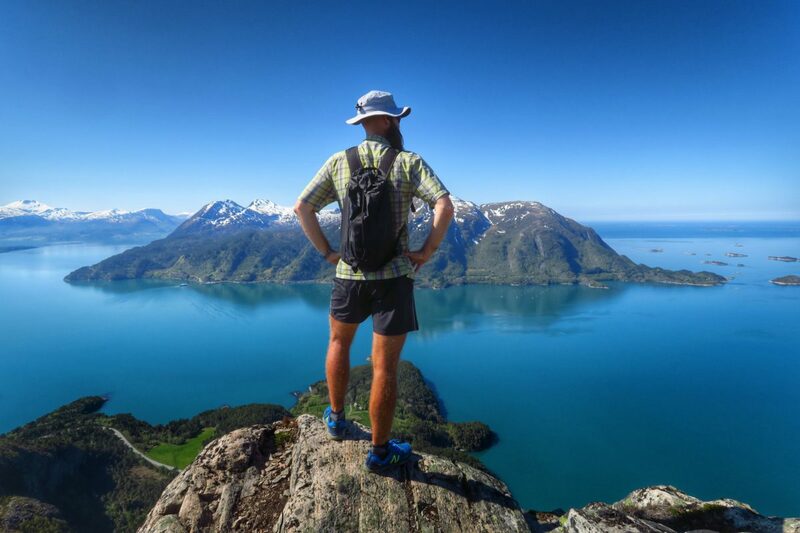 The hike offers stunning views of Lake Ringedalsvatnet and the glaciers on the western side of Sørfjorden. 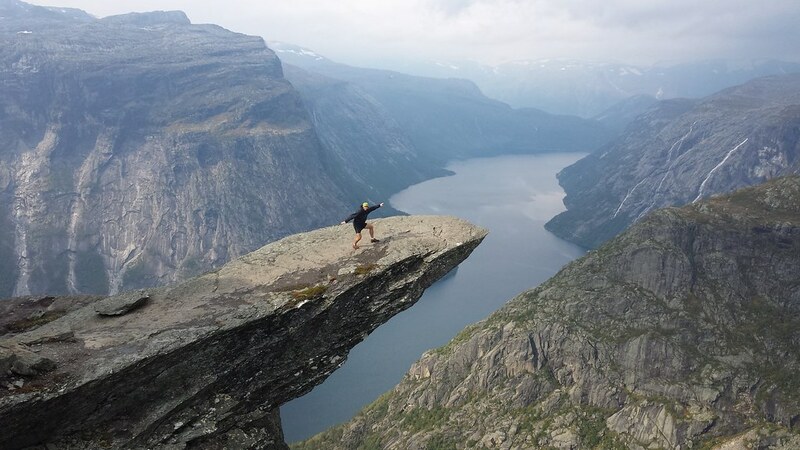 Once you reach Trolltunga you’ll be rewarded with yet another great photo op for social media. 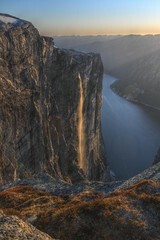 Believe me, you will get many, many likes. It’s wonderful 🙂 Just be careful not to fall off. 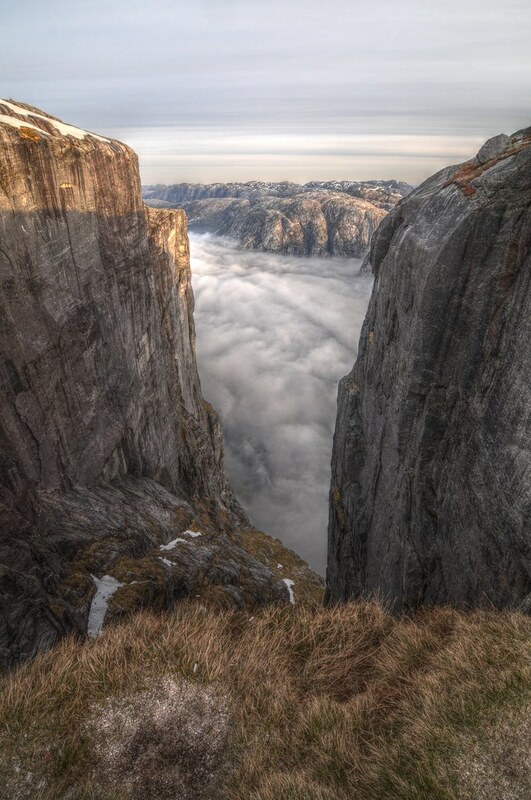 People have died up there. 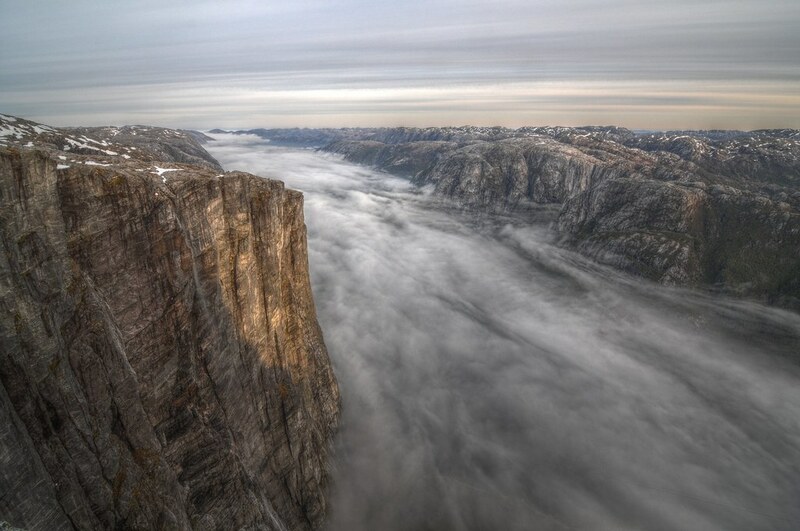 A round trip to Trolltunga takes about 8-10 hours. 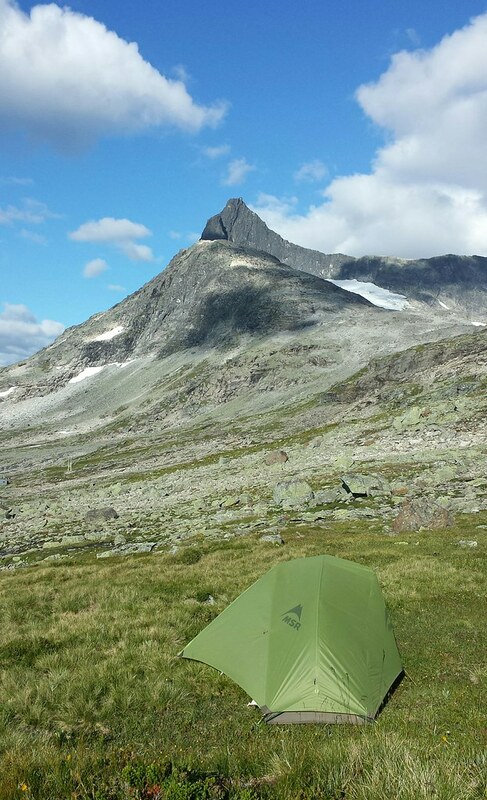 The mountain of Falketind is my personal favourite in the Jotunheimen massif, the home of the tallest mountains in Norway. 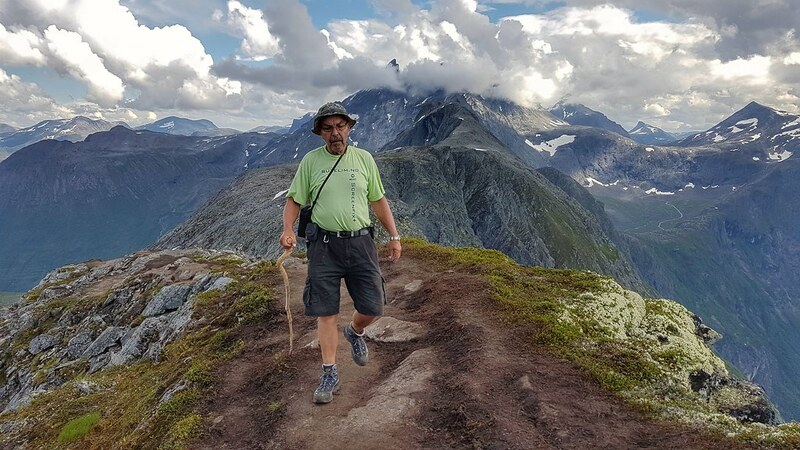 The trail starts at Lake Koldedalsvatnet and runs west through the valley of Koldedalen to Lake Andrevatnet where it turns north and climbs steeply out of the valley before veering east back towards the summit. 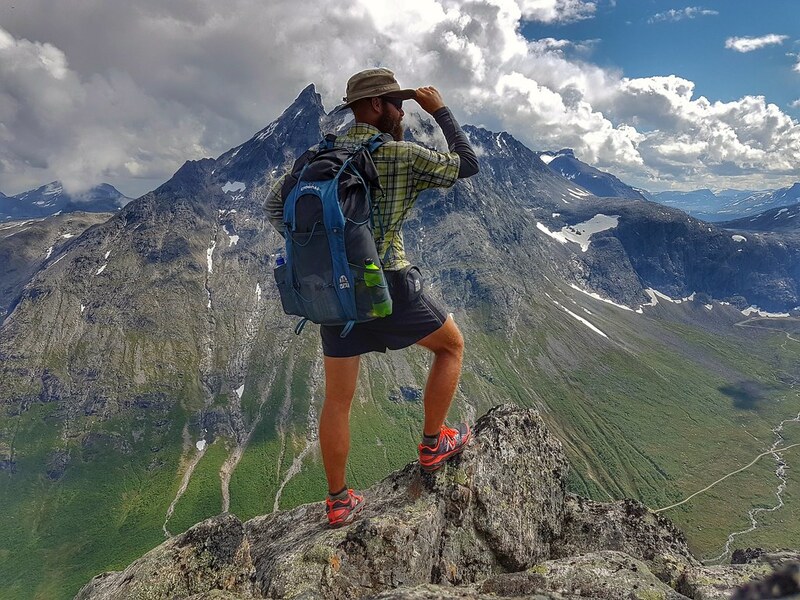 When you reach the summit of Falketind at 2.067 meters above sea level you’ll have striking views of Jotunheimen to the east and north, and the Hurrungane massif to the west. 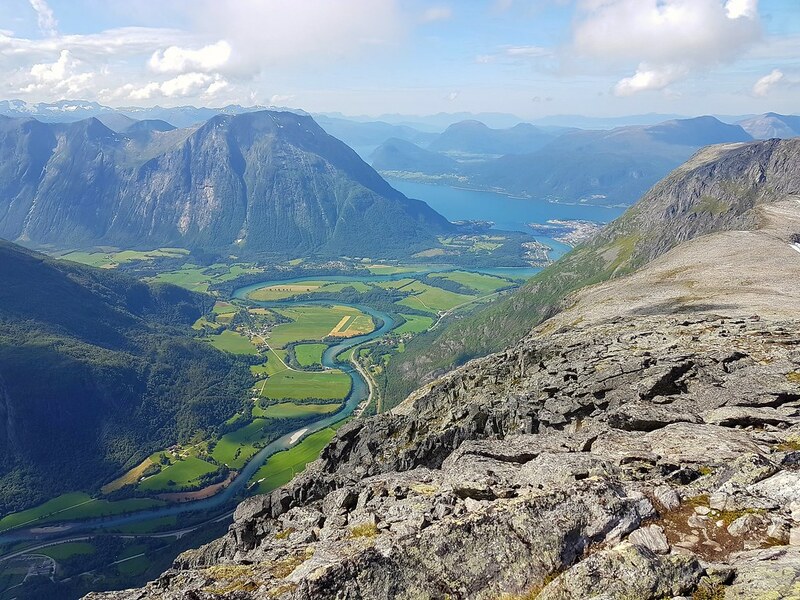 The hike involves some scrambling out of Koldedalen as well as the last few hundred meters just before the summit, but it’s all non-technical. The hike from Lake Koldedalsvatnet to Falketind is 8 km one way and includes 867 meters in elevation gain. 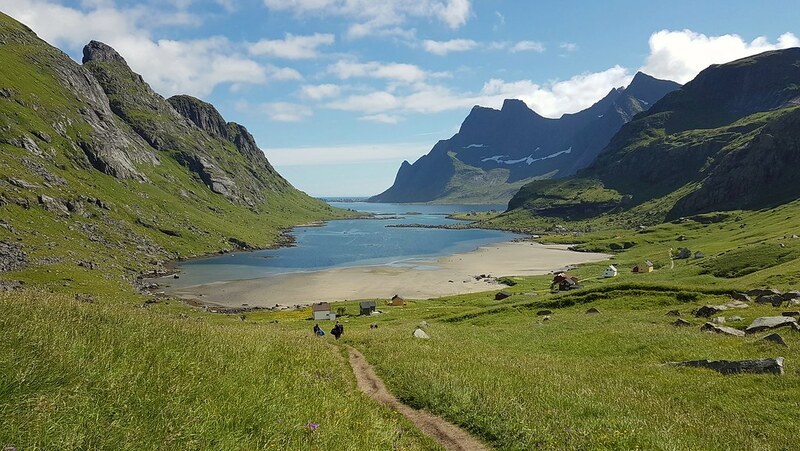 Expect 8-10 hours for a round trip. 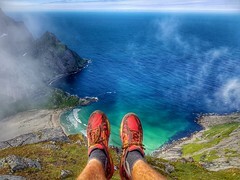 You can read more about how to hike Falketind here. 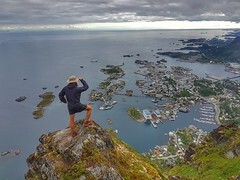 Fløya is the nearest mountain overlooking the town of Svolvær in Lofoten. 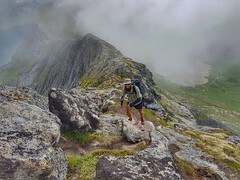 It’s only 5 km round trip, but because it starts at sea level and goes up to 590 meters it is quite steep and involves a little bit of light scrambling some places. 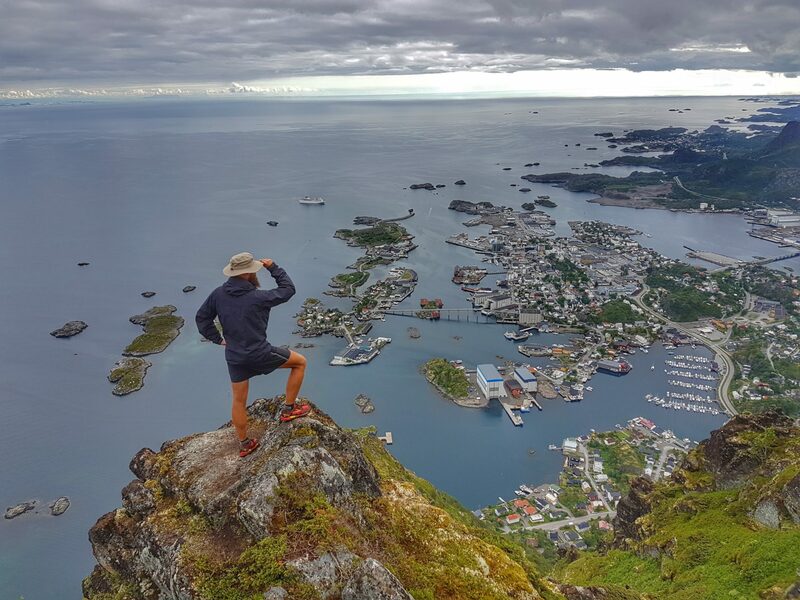 When you get up on the ridge and onto the summit you are rewarded with stunning views of Svolvær and the surrounding mountains, Vestfjorden as well as views of the mainland from Narvik to Bodø. 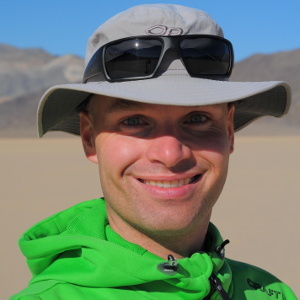 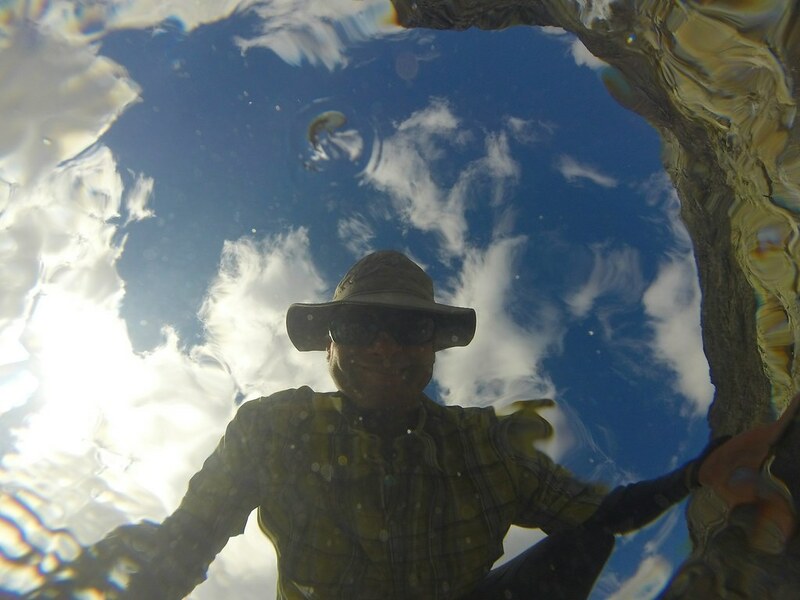 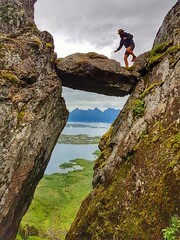 Most hikers also make the small side trip to Djevelporten (Devils Gate) to have their photo taken out on the rock.